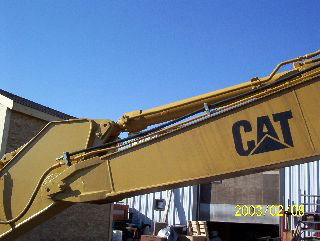 This was a project that we did on a Caterpillar 322 excavator. The customer wanted to run a tamper on the end of the boom but had no way of powering the hydraulic motor. We tapped into an existing outlet on the valve block and installed an electric solenoid to control the hydraulic motor. We ran high pressure lines up over the boom right to the end and capped them off with flat face quick couplers. 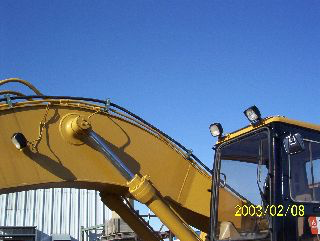 The tamper could then be installed quickly when needed. 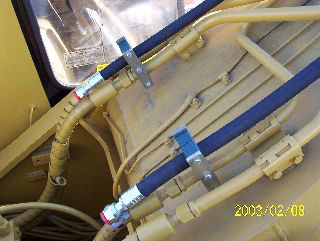 The hoses were attached to the boom with Stauff clamps that were piggy backed onto the existing steel lines. 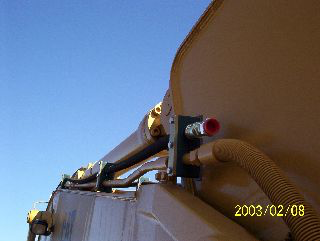 The boom end of the hoses had clamps that were welded to the boom for rigidity.